From a tradition spanning thousands of years comes a piece of art that is a wonderful mix of beauty and practicality. 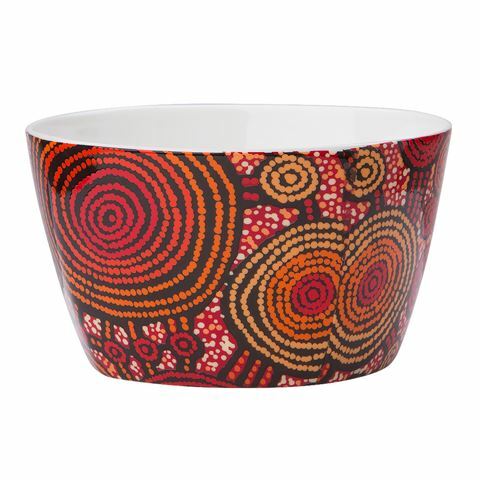 Alperstein’s Aboriginal Art collection has come to adorn some lovely tableware that feature the artworks of some of Australia’s finest artists. With their bold colours and amazing designs, these teapots do true justice to the works on which they’re based…and you’ll find them really handy too! The son of a respected artist, Teddy Gibson was born in the late '60s in Yuenduma, Australia. In his paintings, Gibson uses an expressive and unrestricted colour palette to create artworks that give a modern interpretation of his traditional culture. He paints his Jukurpa stories - or rather, Dreamings from his father's side - that relate directly to his land and feature the plants and animals that inhibit it. This gorgeous painting with its colourful, intricate use of traditional dot-work, is fantastically featured on this fine bone china Bowl from Alperstein. The quaint bowl is perfect for serving small appetisers and nuts at your next dinner party, and can even serve as a traditional display piece for your home. But Alperstein isn't just about fine art from Australia's heritage. Together with Warlukurlangu Artists Aboriginal Corporation, they aim to directly benefit each artist and their community, with all royalties from the Aboriginal Art collection passed along to them. A powerful and ethical way to bring art to life. Dimensions 11.5cm (w) x 6.5cm (h).